On the very day I decided to add the Azure Window in Malta to my itinerary of things I wanted to see on an upcoming vacation, a violent storm in the Mediterranean destroyed it, plunging the rocks into the sea and relegating one of that country’s foremost attractions to the history books. It was a disappointing reminder that nature is both savage and fragile, and that there’s no time like the present to hit the road and check out the earth’s impressive array of unique peculiarities before they disappear. These are my favorites. Some look like columns. Others resemble spires. Still others are just knobby blobs. If you have a particularly active imagination, they could be wildebeest heads, Japanese lanterns, baby pterodactyls, or Gaudí fortresses. 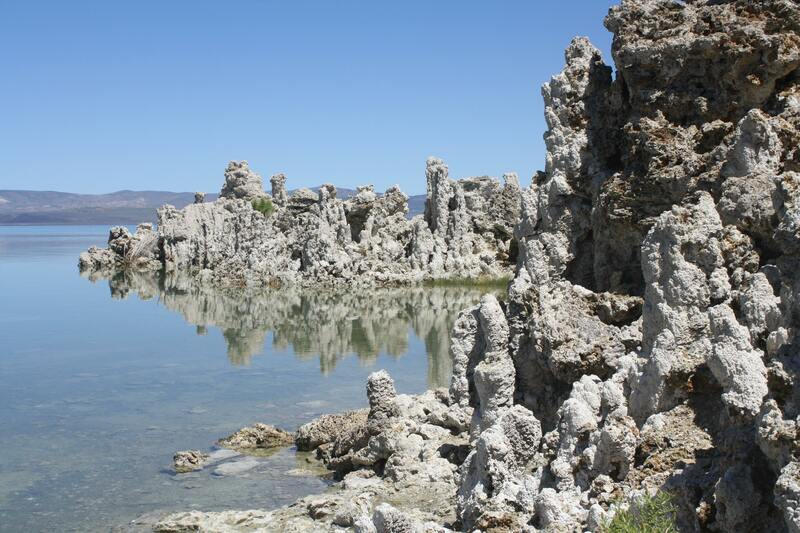 No matter how your eye interprets them, the tufa towers rising from the bed of Mono Lake are simply bizarre. Formerly hidden under the surface of the 65-square-mile lake, which has already celebrated its one millionth birthday, these formations of calcium carbonate are a magnificent site, but they’re really the result of an environmental disaster. They began to reveal themselves in 1941, when Los Angeles started to perniciously divert the lake’s tributary streams 350 miles south to itself to meet growing water demands. Without its freshwater sources, the volume of the lake was cut in half, its salinity doubled, and its surface had plunged 25 vertical feet by 1962. Islands that had served as nesting sites for the more than one million birds that feed and rest here annually became peninsulas — and mammals and reptiles were soon walking over for abundant meals. Although the current lake level is six feet higher than its historic low in 1982, it remains almost 40 feet below the level before Los Angeles gobbled it up. California’s vulnerability to drought, combined with the lake’s annual evaporation rate of about four feet of water, sustain the chances that you’ll be able to view the friable tufa for a long time, but it’s never too early to plan your peregrination here to see what looks like the setting of an interplanetary science fiction flick. A caldera within a caldera: With a pedigree like that, you’re bound to be special, and the landscapes around this extension of Yellowstone Lake prove it. 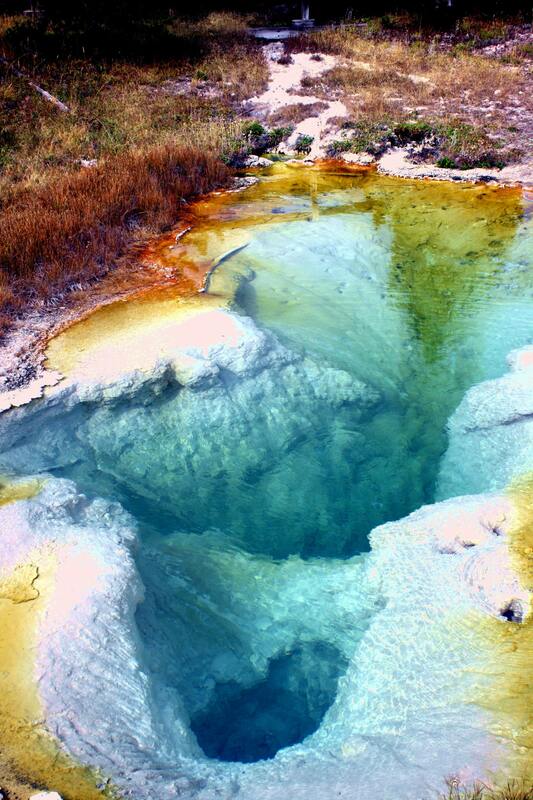 West Thumb Geyser Basin in Yellowstone National Park, one of the top five things to see in Wyoming, is littered with boiling pools, bubbling mudpots, fumaroles, and the Fishing Cone, a geyser that looks like a baby volcano right on the shore of the basin. Even among this stellar grouping of nature’s weirdest creations, it’s the hot springs that really stand out: Black Pool and its intensely blue water, Perforated Pool and its milky blue water, and Blue Funnel Spring, which looks exactly like you would imagine it. Abyss Pool, however, is the one that will leave you breathless. The color of the spring’s water runs almost the full length of the spectrum, from the red ring around its irregular circumference to its dark blue center, the result of pigmented bacteria living on sheets of microorganisms in the mineral-rich water. Peering into its depth of 53 feet, the coral-like sloping walls of the spring are so clearly visible that you’ll want to jump in to explore it more closely, but I’d advise you not to: Abyss Pool will not only take your breath away, it will remove your flesh, too: The temperature stands at 181˚F. Designated a National Natural Landmark in 1971, the Garden of the Gods has always been attracting us, starting with prehistoric people in about 1330 BC, followed by Native Americans who started camping in the park from about 250 BC, European explorers in the 1700s, American surveyors in the 1800s, and, eventually, anyone who wants to see one of the world’s weirdest landscapes. The outstanding geologic features of this 1,400-acre park thrust up from the earth in strange configurations — jagged spires, bulbous mounds, serrated needles. As I weaved my way around them on foot (you can also bike it), I appreciated their assigned names. 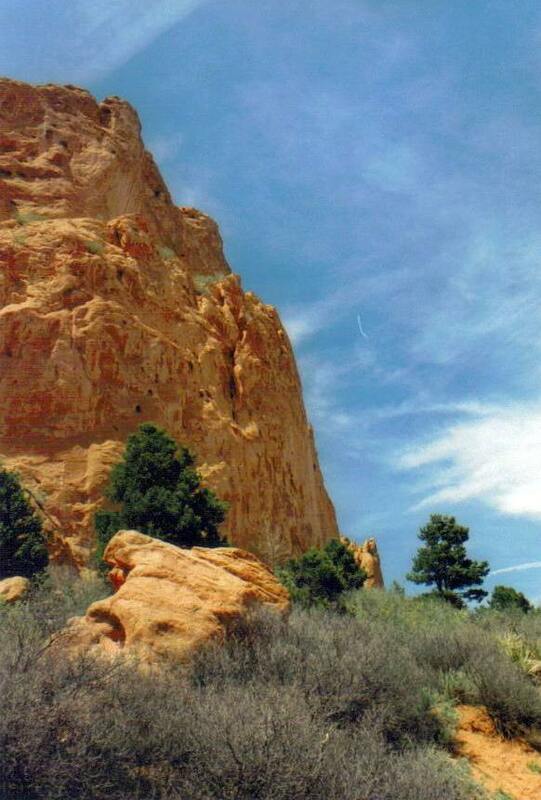 Some are self-explanatory, like Balanced Rock, Siamese Twins, and Sentinel Spires; others challenge you to use your imagination until you see the Kissing Camels and Sleeping Giant. When the sun strikes these anomalies at certain times of day, they glow like embers in a cerulean blue fireplace, easily making them one of the world’s top five oranges. Keep an eye out for rock climbers scaling the near-vertical rises, red-tailed hawks and prairie falcons circling above you, and violet-green swallows and black-billed magpies alighting on a tree or post next to you. 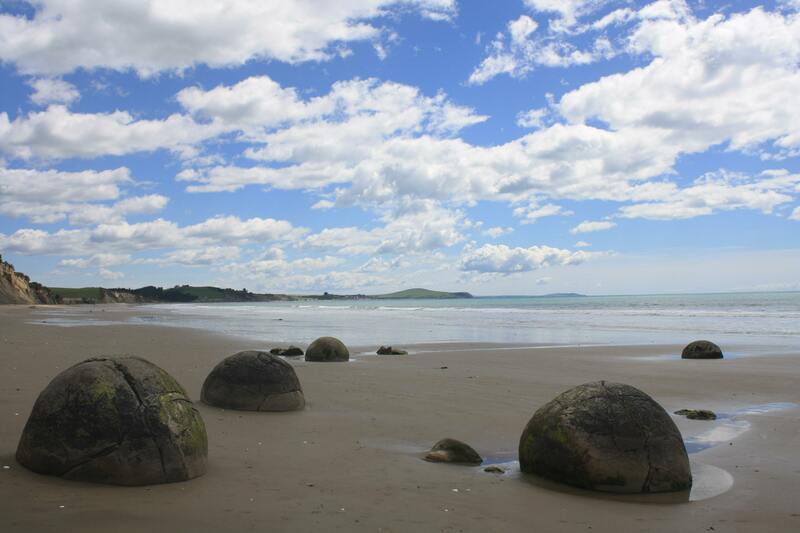 Resembling a popular series of Google Doodle rocks, the Moeraki Boulders litter Koekohe Beach on New Zealand’s South Island. These spherical concretions — hard solid masses formed by the local accumulation of matter over the course of four million years — grew evenly in all directions like pearls on an ancient sea floor about 60 million years ago. As the shoreline receded, land rose and the coastal cliffs that back the beach today were exposed, with the boulders lodged in them. Erosion of the cliffs themselves caused the boulders to be released from their rocky prisons. They tumbled down to the beach, where they have remained ever since. Today, more than 50 of these curiosities are legally protected as a scientific reserve. The largest measures about six and a half feet across and weighs seven tons. Locally referred to as “hooligans’ gallstones” and “bowling balls of giants,” the boulders won’t be around forever. Many are cracked and have split open, like Alien’s eggs in Sigourney Weaver’s nightmare, exposing themselves to the elements. Make sure to peek inside those that have cleaved: The cores are unexpectedly hollow. 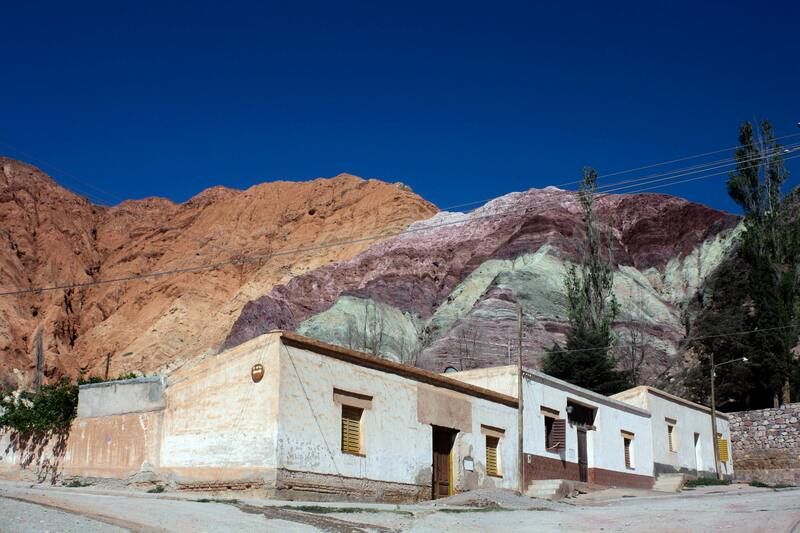 Purple mountain majesties have nothing on the Cerro de los Siete Colores in the town of Purmamarca, the most colorful place in Argentina. On the edge of this dusty and enticing town, the Hill of Seven Colors rises like a ragged area chart filled in with colors from a Pantone color chart. Unlike mountains of gray granite, or those covered by green trees, this single mountain is a riot of honey, lilac, mulberry, orange, paprika, peach, and violet rock. Legend holds that the town’s children, refusing to accept that the hill, originally without color, should stay that way, painted it a different color every night for seven nights. Science provides a less alluring explanation: Formed around 75 million years ago as the land rose in tectonic shifts, the hill acquired its stunning hues as the result of minerals in the sedimentary strata picking up vibrant pigments. This magical monument of impossible colors truly astounded me, particularly on a sunny day when the cloudless and solid cobalt-blue sky provided a wonderful contrasting background.